...and a great star fell from heaven, blazing like a torch. 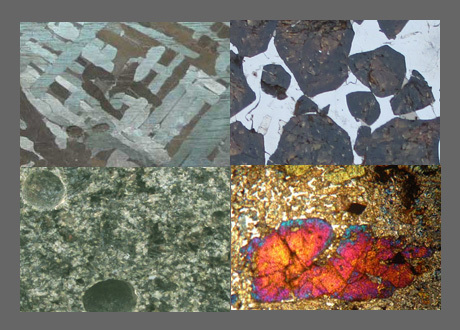 Baitylia, 'animated stones', are said to be invented by Uranos. This is a mythological circumscription of its celestial nature as meteorites which is confirmed by other references too: Baitylia come from the sky and move jumping through the air; they occur alone or in swarms. Of various, sometimes changing, colour they hold in its spherical cover an extraterrestrial core. Some have magic power and the gift of prophecy, and are so the place of supranatural power; its annunciations based on the authority of mighty gods (Zeus, Kronos, Helios). "There is also a good deal of evidence to show that certain natural blocks derived their baetylic qualities from the fact they were of meteoric origin. According to Sanchoniathon, “Baetylos’ is the son of Ouranons”, in other words sky-fallen. The phenomena associated with aerolites seem indeed to a certain extent to have attached themselves to the whole class of sacred stones. The early cults of the Greek world supply a good illustration of this class of ideas in the ‘rude stone’ that stood near Gythion in Laconia, and was known as Zeus Kappotas – in other words Zeus “fallen down” from heaven. either the Stone of Emesa or the Stone of Sidon. They were paraded around the city in this cart or chariot. 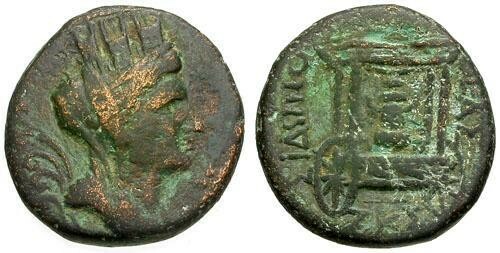 Hadrian, Phoenicia, Sidon, struck AD 117 - 118. Laureate bust right, slight drapery on left shoulder. 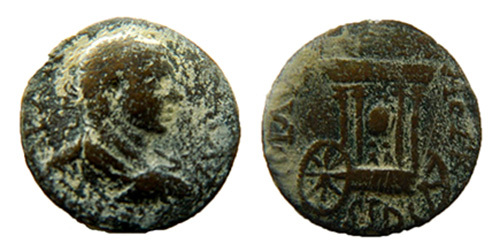 Baetyl within Cart of Astarte. AE 23, 9.91 g, 23 mm. standing on the Sacred Stone of Emesa / Baetyl of El-Gabal. there is a least one showing the eagle standing left. during which he paraded the holy stone through the city of Rome. the vehicle was escorted as if the god himself were the charioteer. looking up into the face of his god." of this scarce coin can cost over $1000. – a rounded sacred stone or meteorite that had fallen from the sky. The number following these letters is the approximate diameter in millimeters of the coin. 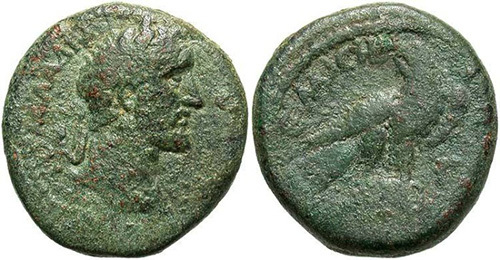 Grading of the coins condition is a matter of opinion.